I've started a daily exercise program that should begin at a brisk pace, but all the wildlife at the pond is distracting. 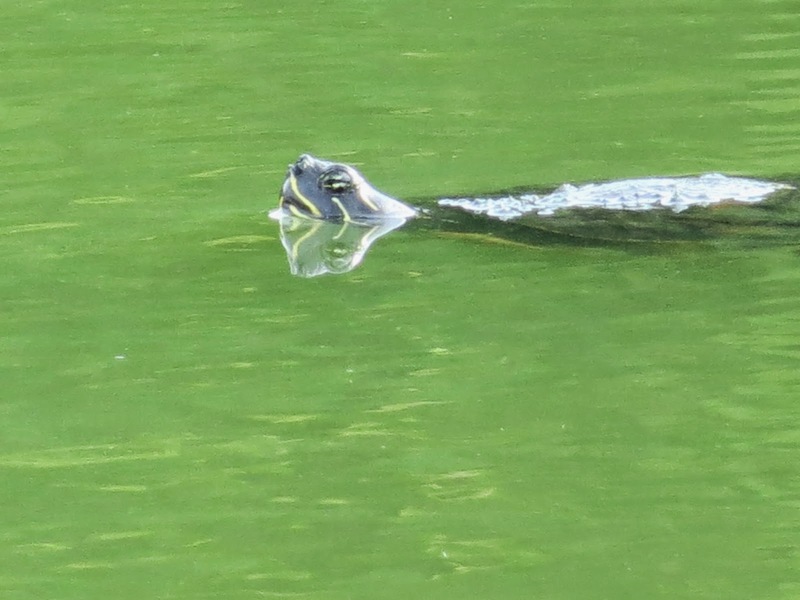 This morning I spotted a turtle swimming far out in the middle of the lake. It was about the size of a dime, until I zoomed in. Trying to focus, the lens bounced, I couldn't make out his face; he appeared headless. Asking the Holy Spirit for help, I took several shots, but it wasn't until the pics were uploaded, I found that I had what I had been seeking. His head was above water and the expression on his face, priceless. I realized then how my eyes had been deceiving me as I had only been able to see the contact point where the reflection and reality began to meld. So it is with us when we try to perceive a particular situation. It seldom is as it appears to be. Asking for divine help is a good way to gain clarity. In many societies turtle was a symbol for Mother Earth, the shell represents the world, which she carries on her back. When a turtle appears it is a sign that a new world is opening up with new opportunities. We have gone within our shell and it is now time to come out and express ourselves. Turtle tells us to trust that the vibrations are good now for making a move.